It is still a mystery how Humboldt penguin, a living being on the earth survived the harsh Martian conditions. 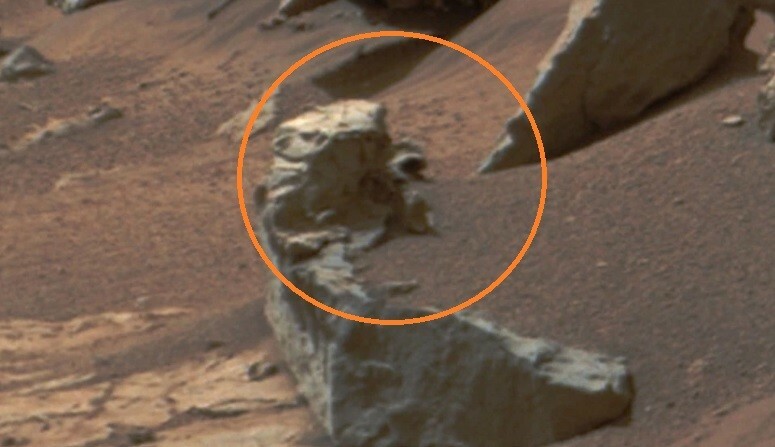 An amateur astronomer named Steve Martin has claimed to have discovered a solid proof of alien life on Mars. Martin made this revelation after spending many hours trawling through the images taken by NASA from the Red Planet. After a deep search, Steve Martin spotted a Humboldt penguin sticking its head out from behind a rock, and he claimed that it is irrefutable proof of alien existence. It should be noted that Humboldt penguins are usually found in South America, and it came as a real surprise to see a structure very similar to a living creature on the Red Planet. "I've always thought there was life on Mars and now I think I might have proved it. I have spent hours looking at Nasa images but I never thought I would find a penguin. I don't know how it got up there but I hope Nasa carefully study the picture and can work out how and why," said Steve, the Sun reports. The new discovery comes just a few days after scientists released the first ever picture of a black hole. Recently, a study published in the Journal of Astrobiology and Space Science had suggested the possible presence of alien life forms on Mars. During the study, researchers analyzed several pictures snapped by NASA's Curiosity Rover, and discovered algae and fungi growing on the Red Planet. Dr Regina Dass, of the Department of Microbiology, School of Life Sciences, India who is the lead author of the study revealed that there are at least 15 NASA images that show fungi and algae growing on the Martian surface. A few days back, Scott C Waring, another extraterrestrial researcher who operates from Taiwan had claimed that he discovered an alien base, tunnel and a pyramid on Mars. However, experts soon dismissed his claims and classified it as a case of pareidolia. As per experts, pareidolia is a peculiar capability of the human brain to form recognizable images on unknown patterns.